It’s raining mice! We’ve all heard the saying “It’s raining cats and dogs” but on our last hike it rained mice (well a mouse anyway). I’ll explain that later, but for now let me tell you where we were. For Father’s Day we headed toward Mt. Hood and the Salmon-Huckleberry Wilderness. Our plan was to head to the top of 4877′ Salmon Butte where we hoped to have a view of about a half dozen Cascade peaks. The trail head is located next to the Salmon River, a fork of which it quickly crosses on a old bridge. The river is left for good here as the path follows an abandoned road up toward a former trail head. The road was closed down due to repeated washouts which we could see evidence of as we passed over numerous small creeks. 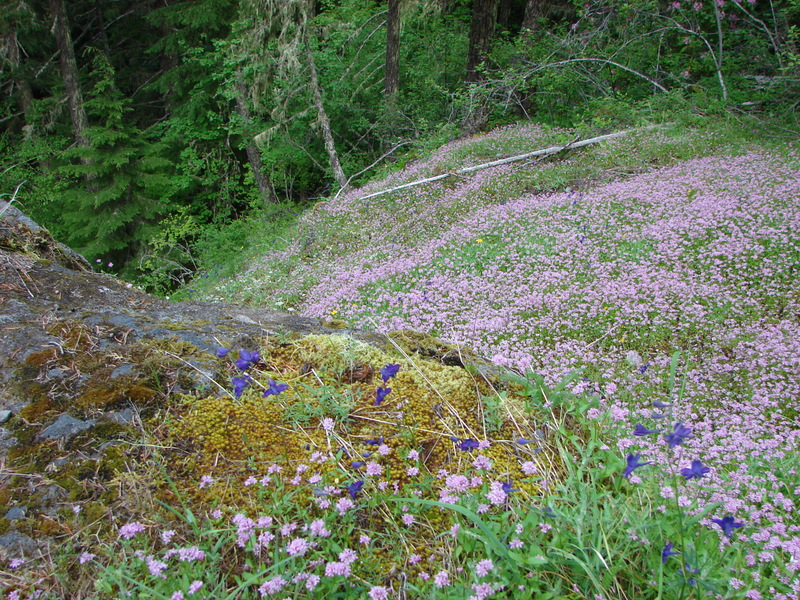 The roadbed was fairly overgrown with green grasses and many small flowers. After travelling on the road for a little over a mile we reached the former trail head and turned into the forest. Not long after entering the forest a we came to a sign announcing the boundary of the wilderness. This was our first visit to the 62,455 acre Salmon-Huckleberry Wilderness which is part of the Mt. Hood National Forest. The trail offered no real views for the first 2.5 miles as it steadily climbed up through the forest. Rhododendrons lined the trail, many of which were in bloom adding a splash of pink amid the green. Although the total elevation gain for the trail is almost 3200′ it was rarely steep and never for very long which was a welcome change to last week’s trudge up Heartbreak Ridge. At the 2.6 mile mark a viewpoint at a rocky ridge end opens across the Mack Hall Creek Valley and to Salmon Butte itself. 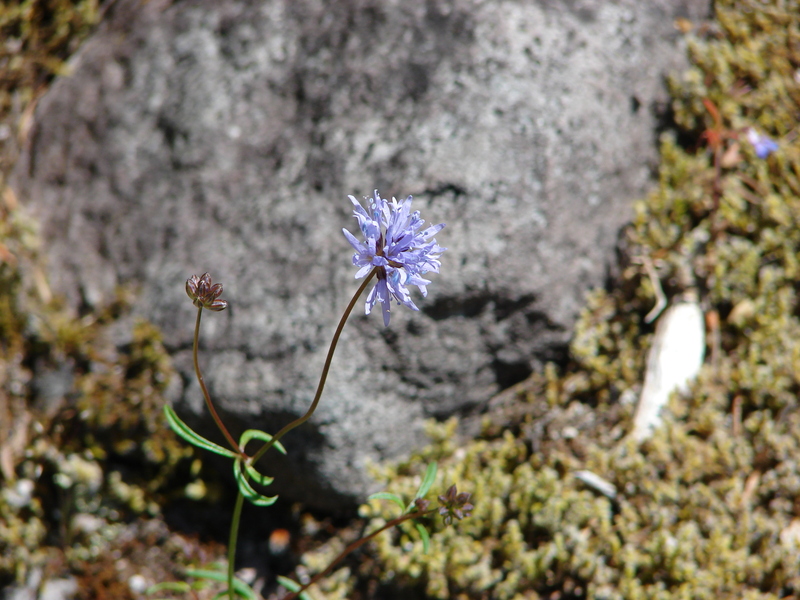 The ridge end was home to a small but diverse number of flowers. There were a couple red paintbrush, a single lupine, a lone cats ear, a couple of yellow flowers, and a blue filed gilia which was a first for us. Leaving the viewpoint the trail reentered the forest and climbed along the west side of a ridge for 2 miles before we would reach the next viewpoint. Still there was plenty to keep us entertained which is where the mouse rain incident occurred. As we were walking along I saw something out of the corner of my eye and heard a “thump” on the hillside just to the left of us. My first thought was pine cone, but the thump was too loud and the color wrong for a cone so my next thought was that someone had thrown a rock at us. It nearly rolled into Heather. As she attempted to avoid it we realized it was an animal. The poor mouse got its bearings and scurried off the side of the trail and disappeared into the brush. We have no idea where it came from, if it just slipped or possibly escaped from a bird in the trees above, but we certainly won’t forget our first encounter with mouse rain. At a switchback near the 3.9 mile mark a short side path extended out to a small but amazing hillside meadow. There was no view to speak of but the hill side was carpeted with plectritis, larkspur, and little yellow monkeyflowers. The trail eventually moved from the west side of the ridge to the east and shortly after reached a viewpoint with the first view of Mt. Hood. Here beargrass and rhododendrons lined the trail in various states of bloom. For the next half mile the trail climbedd gently along the top of the ridge before a couple of steep switchbacks reached a second abandoned road. This was the road to the former lookout tower that no longer exists on Salmon Butte. As the road curved up around the summit Mt. Jefferson came into view to the south followed by Mt. Hood to the north. After .3 miles we reached the summit and sweeping across the Salmon-Huckleberry Wilderness to the north, south, and east. Although there were a few clouds in the sky we had an excellent views of Mt. Hood and Mt. Jefferson. Mt. Adams and Mt. 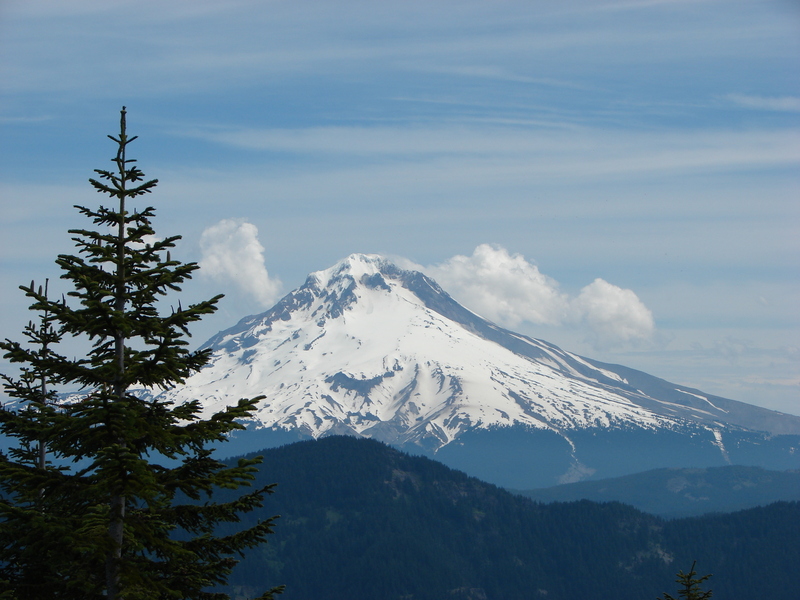 St. Helens were clearly visible in Washington and the North Sister was peaking over the shoulder of Mt. Jefferson to the south. With an assist from the binoculars we were finally able to identify Mt. Rainier as well. We enjoyed a peaceful lunch as the only people on the summit. We were not alone though. A couple of swallowtail butterflies flitted around the summit and a gray jay flew up to check us out. There was also a chipmunk busy eating seed on a tree trunk, obviously knowing this was a perfect spot for lunch. Hadn’t heard about your encounter with mice rain until reading this. Always fun to have a new experience although I can think of better rain than mice (like chocolate or licorice).